Yesterday, March 17th, Boeing successfully completed the initial functional check flight for its brand new 757 ecoDemonstrator, part of a collaboration with NASA’s Environmentally Responsible Aviation Project. The aircraft was specifically designed to test and evaluate new wing and tail technologies aimed at reducing drag and improving operating efficiency. 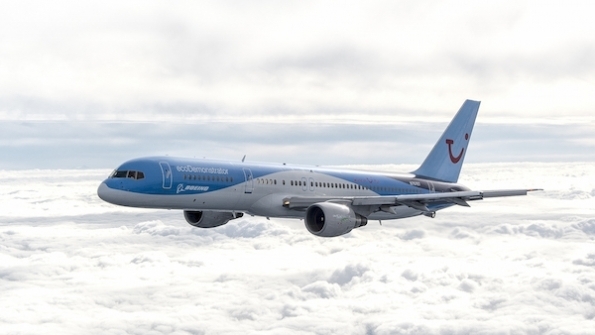 European-based airline group TUI is also a major player involved in the project, responsible for providing the plane itself which is equipped with two wing state-of-the-art design technologies and an active flow control feature in the vertical tail. The wing tests will focus on the ability of a wing to maintain low-drag laminar flow by minimizing the insect strikes/residue that builds up along the leading edges. The active flow tests, on the other hand, will determine the best way to increase rudder effectiveness in order to enable future planes the ability to feature smaller vertical tails, lower weight, and lower drag, among other things.